Paneer 65 – One Half Indian. We’ve been on a homemade paneer kick around here. After buying paneer from the store for forever, we finally read the ingredients. Well, my husband read the ingredients. Paneer is really a two ingredient dish, but these paneers from the store had a laundry list of other gums and such added. So, we decided we were going to do homemade paneer from now on. It’s honestly one of the easiest Indian dishes I’ve ever learned and definitely the easiest cheese I’ve ever made. 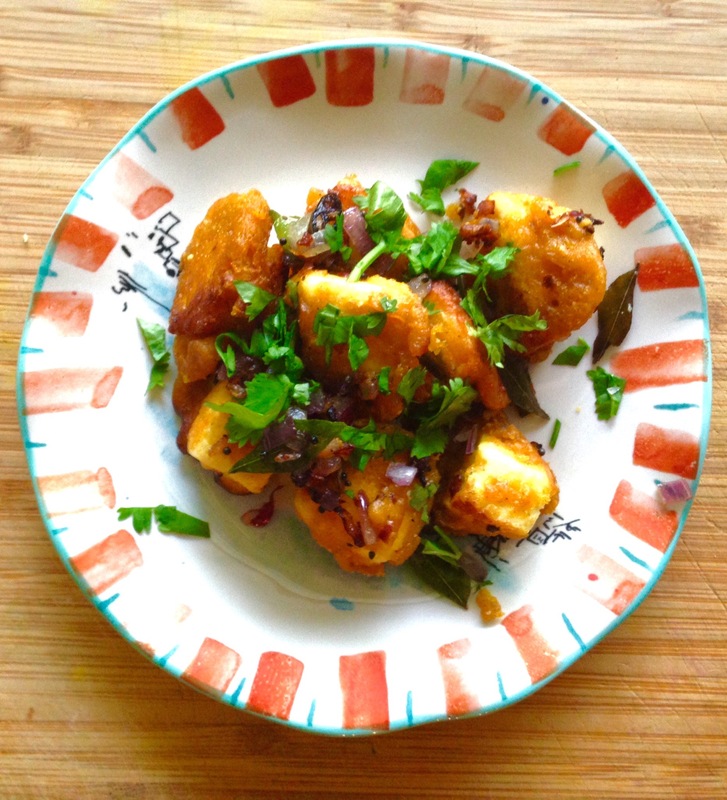 With all this fresh paneer around these days, I wanted some new recipes for it! 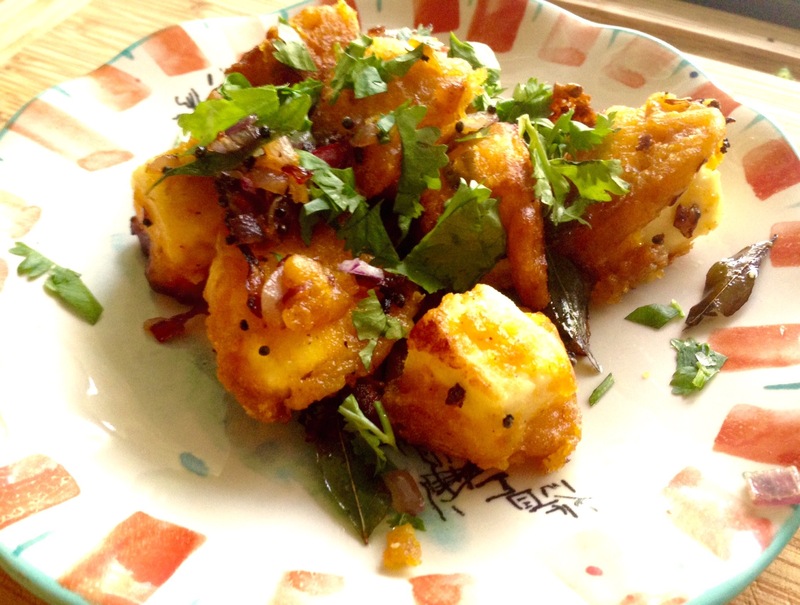 I found Paneer 65 on Dassana Amit’s blog, Veg Recipes of India. You definitely don’t have to make your own paneer at home (but if you want to, here’s a link to the oh-so-easy recipe). Store bough paneer will work just fine in this dish. We ate the paneer as is, but they could be good with a sauce or chutney too. I think this “65” batter recipe is pretty good and could be used on vegetables also. It definitely would make a lovely Cauliflower 65. In a small food processor or in a mortar and pestle, mash/blend chili, ginger, and garlic into a paste. It’s okay if there are still some small chunks. I did mine in the mortar and pestle, and the mix was not very smooth. In mixing bowl, add rice flour, besan, cornstarch, garam masala, salt, lime juice, and ginger/garlic/chili paste. Add water and whisk until smooth. Add the paneer cubes. Cover and allow to marinate for about 15-20 minutes. Heat 5 tbsp oil in a pan on medium-high heat. Add paneer cubes to the pan. While adding. re-dip in batter to be sure each piece has a generous amount of batter surrounding it. Space the paneer cubes out in the pan so that they don’t stick together. Once the bottom is cooked, flip the paneer cubes. You want them to be a nice golden color and crispy. You may flip a few more times until finished. Don’t over fry or else the paneer will become dense. When finished, remove the paneer cubes to a paper towel to drain excess oil. In same pan, heat 2 tsp oil. Add mustard seeds. After the seeds pop, add ginger, garlic, chilies, and curry leaves. Stir well. Watch heat closely to be sure these are not burning. You may need to lower heat. Add onion and sauce all together until they are translucent. Add salt and sugar. Stir. Add paneer cubes back to pan and toss the ingredients together. Add more salt if needed. That makes me hungry just looking at it! !